Last night I was suppose to go to Oyster Boy with my friend Anita. I have never been to this well known Toronto restaurant and was really looking forward to it. Unfortunately I wasn't feeling well and ended up staying in. 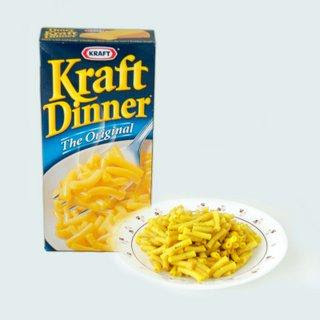 I had picked up a box of Kraft Dinner at the grocery store a few weeks ago when it was on sale. It's not something I normally have in the house, but was grateful for it last night. When your not feeling well, quick and easy are what I want in food preparation. I'm almost embarrassed to say that I actually enjoyed it. Not as much as I'm sure I would of enjoyed my meal at Oyster Boy, but it hit the spot last night.